Today is Hagfish Day, the fourth annual celebration of ‘the beauty of the ugly’, which was started up by the fish fans at WhaleTimes.org to introduce people to some of the weirder creatures that inhabit the seas. 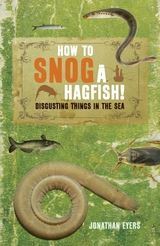 But the hagfish is only one of hundreds of bizarre species featured in the book. There are fish with transparent heads and visible brains. There are shrimp that can smash their way out of glass aquariums. There are sharks that glow green when they come for you. There are sea cucumbers who can turn themselves inside out. There are starfish whose legs detach and crawl off to start up a new life on their own. And then there are the wonderfully named Seaweed of Death from Hana and Bone-eating Snot Flower. This entry was posted in video and tagged animals, disgusting things in the sea, nature by ensigneyers. Bookmark the permalink.